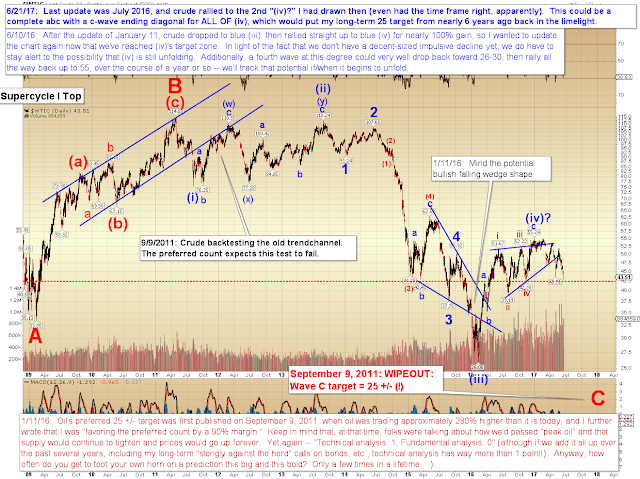 Nearly six years ago, I wrote that I believed the odds were 90% that the top was in for crude oil, and that it was headed to 25 in the coming years. People thought I was nuts, but I remained bearish until January 2016, when I warned that oil was likely to find a bottom near the 25 target zone and bounce all the way back to 50-55. This was about the time that everyone else was finally growing very bearish, but oil indeed bottomed at 26, and then bounced up to 51.67. 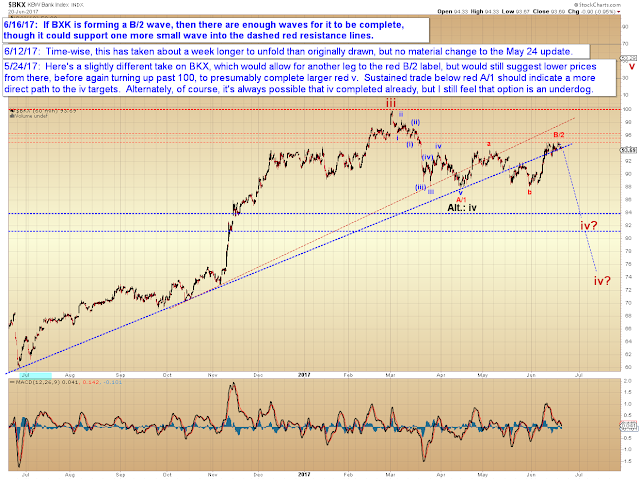 In mid-2016, I noted that 51.67 could be the top of the predicted fourth wave, but that it was reasonable to consider that a fourth wave at such a large degree might well take up more time -- so I placed a 2nd target for (iv) near 55, with a time target (which I don't normally do) in the December 2016-January 2017 zone. 1. The new multi-month low breaks the potential of an abc off the high. 2. 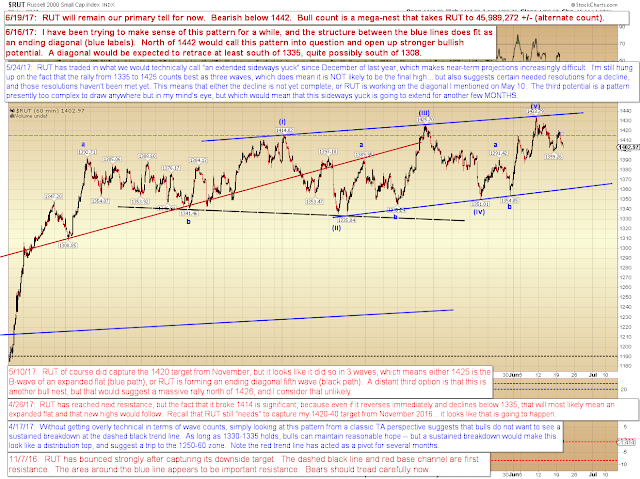 The rally from 26 counts well enough as an ABC with a c-wave ending diagonal, and that pattern meets the requirements for a complete wave (iv). Thus, we probably have to presume that the (iv) label is correct, unless/until crude gives us a sign that something else is going on. Equities had a less-than-perfect day yesterday. 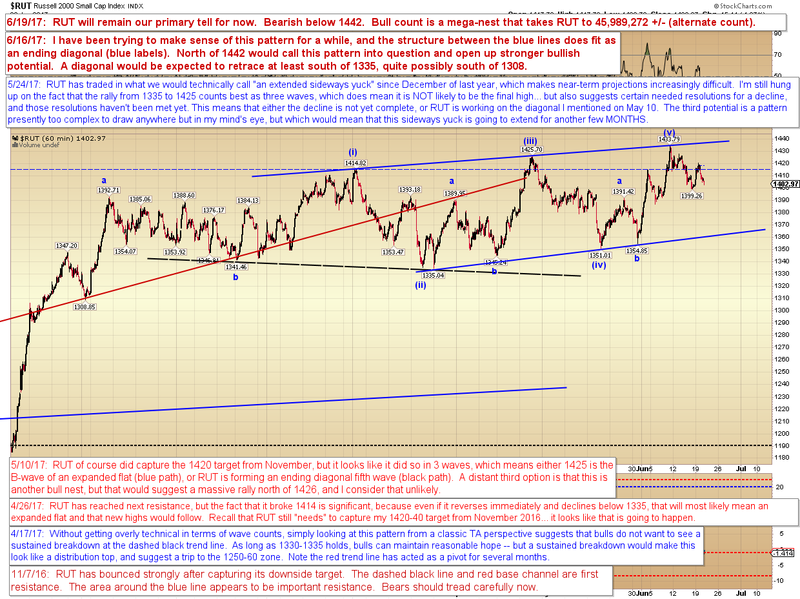 I would like to see RUT claim 1399 for some bearish confirmation. BKX got another wave up as I was hoping, but there's no guarantee that wave is complete yet -- ideally, it's complete or close to it, but I can't entirely rule out another trip into the red resistance zone yet. NDX is interesting -- and here, NDX would definitely look a bit better with another push up to 5800+, either immediately, or after another down/up move. The tricky part is that there are enough squiggles for ALL OF Bear B/2 to be complete, if the micro fourth and fifth waves were compressed. In other words, you can find the waves there if you look closely -- but they didn't unfold in the "usual" way, so we have to allow a little wiggle room. 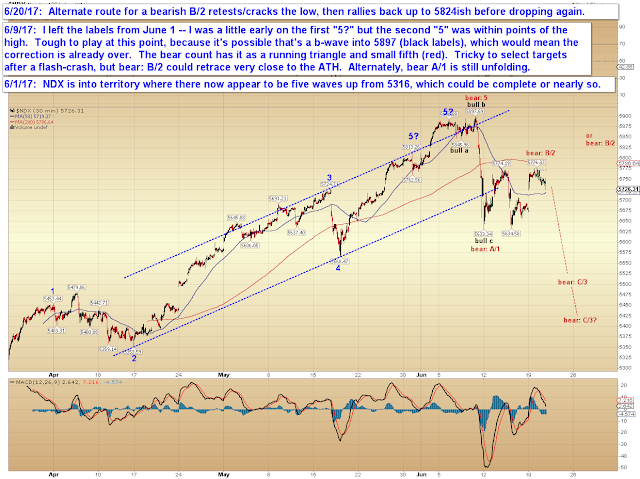 Either way, right now this pattern fits the bigger picture as a flat Bear B/2 correction, so using only NDX's CURRENT appearance (which can always blow up tomorrow, of course) as a guide, there may be another large down leg still pending. Astute readers will notice that I didn't publish an SPX chart today, and that's because SPX is chartable only in a speculative way at this exact moment. There are at least 3 viable patterns visible there, but no clear hands-down victor -- so I don't want to chart the options and encourage people to ignore the ones they don't "like" and merely trade their bias. Thus I'll wait until it's a bit more clear. 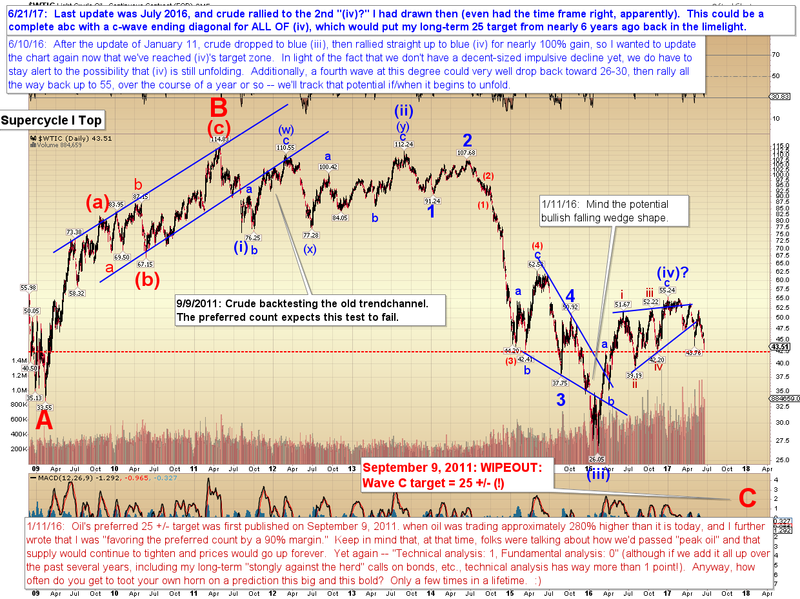 In conclusion, crude's new low today hints that perhaps ALL OF the big (IV) is indeed complete. Equities are in a position where bears can take the wheel if they're so inclined, but no indices have given bearish confirmations just yet. That said, INDU does look very toppy on a near-term basis, so unless/until bulls can reclaim the ATH there, I'm inclined to lean bearish on even the major indices, at least for the near-term. Trade safe.